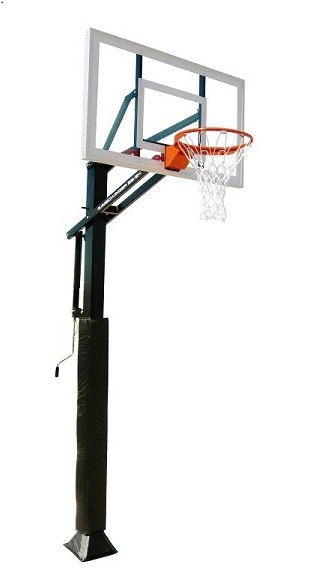 First Team Basketball Hoops from Basketball Hoops Unlimited - GAME CHANGER 54 - 54 inch Glass, 5 X 5 Pole. GAME CHANGER 54 by Ironclad Sports, Inc. 54" Tempered Glass Backboard. 5" X 5" Pole. Powder Coated Finish - Lifetime Warranty! Rim Lowers to 7-1/2' Feet. Includes Free Pole Padding and Free Gusset Padding. 54" x 32" x 1/4" Thick Glass Backboard. BACKBOARD: 54" X 32" X 1/4" Tempered Glass Backboard. The backboard has a lifetime warranty against breakage during dunking because the rim is bolted directly to the pole system and not to the backboard. You don't have to worry if someone hangs on the rim. Add premium molded bolt-on backboard padding in choice of 5 colors for only $139.00 (select above). POLE: NOW WITH A ONE-PIECE POLE. 5" x 5", thick 12 gauge square steel pole. Powder Coated for a rust proof finish. Removable bolt-down style pole system with included anchor system. Includes FREE pole padding and gusset padding (select above). POLE: 5" X 5", 12 ga. ONE-PIECE Steel, Bolt-Down Base. BACKBOARD: 54" X 32" X 1/4" Thick Tempered Glass. PADDING: Free Pole and Gusset Pad. Backboard Pad Optional. SYSTEM WEIGHT: 247 lbs. (shipping weight: 282 lbs.). We proudly use ABF Freight System, Inc. to ship our basketball hoops. North America's most trusted carrier, they provide our customers with Award Winning curb side service throughout the US and Canada. Free Lift Gate Service is provided where required. Shipping Weight: 282 lbs. in 3 cartons. "Limited Time Offer: Free Shipping, Free Padding and Free Gift"